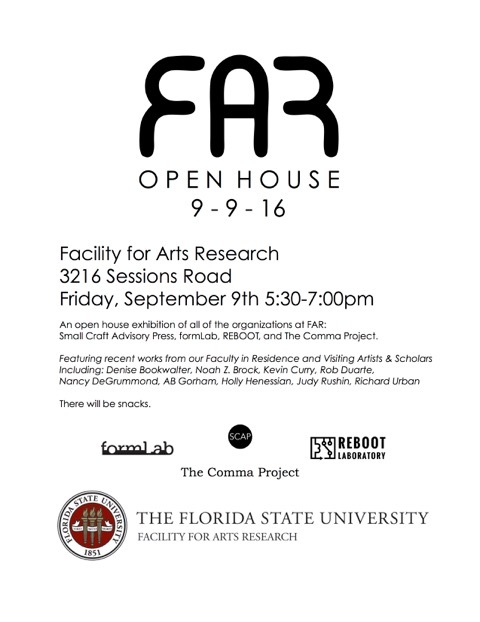 The Facilities for Arts Research will be holding an open house on Friday, September 9th from 5:30 to 7:00PM. This open house is an exhibition of all organizations at FAR: Small Craft Advisory Press, formLab, REBOOT, and The Comma Project. Featuring artists from our Faculty in Residence and Visiting Artists & Scholars including Denise Bookwalter, Noah Z Brock, Kevin Curry, Rob Duarte, Nancy DeGrummand, AB Gorham, Holly Hanessian, Judy Rushin, Richard Urban.